￼ ￼ The first essay explores the emergence of a new paradigm for Western science to replace materialism. The subject is explored from three perspectives: Kuhn’s theory of scientific revolutions, Sarkar’s theory of microvita and Sarkar’s theory of cognitive evolution. The essay concludes that there is more at stake here than just philosophy of science – achieving an equitable and sustainable globalization is also at stake. The second essay is an introduction to Sarkar’s cosmology, Brahmcakra, and compares it with the cosmology of Western science. The comparison is interesting because the two cosmologies are very different yet both claim to describe the universe in which we live. Finding a correspondence between them would have been difficult prior to the 20th century because Western cosmology was preoccupied with the world of matter and Eastern cosmology with the world of mind and consciousness. However this situation changed significantly in the second half of the 20th century due to the pioneering synthetic work of Fritjof Capra (The Tao of Physics) and Ken Wilber (Eye to Eye). This essay follows in their footsteps and attempts a synthesis of Brahmcakra with Western learning. The third essay, The Dawn of Enlightenment, is a brief introduction to the history of yoga and spirituality in India. Ramesh Bjonnes argues for the two river theory of Indian culture – that what the world now knows as yoga (which actually includes a variety of spiritual and health practices, such as meditation, breathing exercises, eating habits and body postures) has its origins in a fusion of indigenous Indian Tantra with Aryan introduced Vedanta. To his theory Bjonnes brings a variety of anthropological, linguistic and genetic evidence. 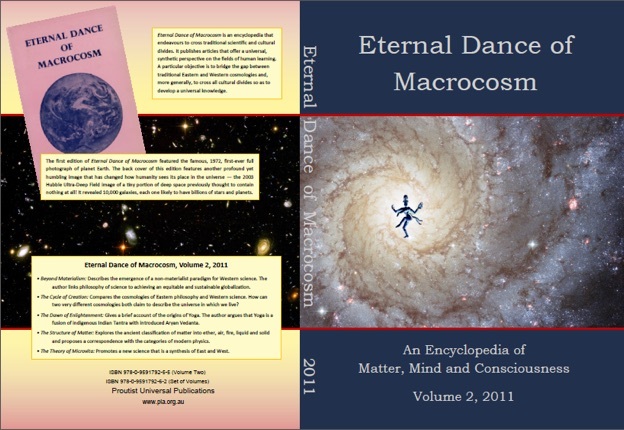 The fourth essay, The Structure of Matter, compares two descriptions of the physical universe, that of modern Western physics and that of Tantra, which is the ancient spiritual tradition of the Indian subcontinent. It proposes that Tantra’s classification of matter into ether, air, fire, liquid and solid is not as naïve as it might seem to the modern Western mind. The essay proposes a correspondence between the five fundamental elements of the old world and the fundamental particles of modern physics. The fifth essay concerns Sarkar’s difficult theory of microvita. In fact the theory is introduced in the first two essays in the volume. Michael Towsey suggests the theory promotes a new way of doing science that involves a synthesis of East and West. The contribution of the West is its rigorous three-part methodology of observation, rational theorizing and validation. The contribution of the East is to expand the domain of legitimate experience to include intuitional and spiritual experience. Western science must move beyond the dogma of materialism if it is not to create more problems than it solves. The first essay explores the emergence of a new paradigm for Western science to replace materialism. The subject is explored from three perspectives: Kuhn’s theory of scientific revolutions, Sarkar’s theory of microvita and Sarkar’s theory of cognitive evolution. The essay concludes that there is more at stake here than just philosophy of science – achieving an equitable and sustainable globalization is also at stake. The second essay is an introduction to Sarkar’s cosmology, Brahmcakra, and compares it with the cosmology of Western science. The comparison is interesting because the two cosmologies are very different yet both claim to describe the universe in which we live. Finding a correspondence between them would have been difficult prior to the 20th century because Western cosmology was preoccupied with the world of matter and Eastern cosmology with the world of mind and consciousness. However this situation changed significantly in the second half of the 20th century due to the pioneering synthetic work of Fritjof Capra (The Tao of Physics) and Ken Wilber (Eye to Eye). This essay follows in their footsteps and attempts a synthesis of Brahmcakra with Western learning. The third essay, The Dawn of Enlightenment, is a brief introduction to the history of yoga and spirituality in India. Ramesh Bjonnes argues for the two river theory of Indian culture – that what the world now knows as yoga (which actually includes a variety of spiritual and health practices, such as meditation, breathing exercises, eating habits and body postures) has its origins in a fusion of indigenous Indian Tantra with Aryan introduced Vedanta. To his theory Bjonnes brings a variety of anthropological, linguistic and genetic evidence. The fourth essay, The Structure of Matter, compares two descriptions of the physical universe, that of modern Western physics and that of Tantra, which is the ancient spiritual tradition of the Indian subcontinent. It proposes that Tantra’s classification of matter into ether, air, fire, liquid and solid is not as naïve as it might seem to the modern Western mind. The essay proposes a correspondence between the five fundamental elements of the old world and the fundamental particles of modern physics. The fifth essay concerns Sarkar’s difficult theory of microvita. In fact the theory is introduced in the first two essays in the volume. 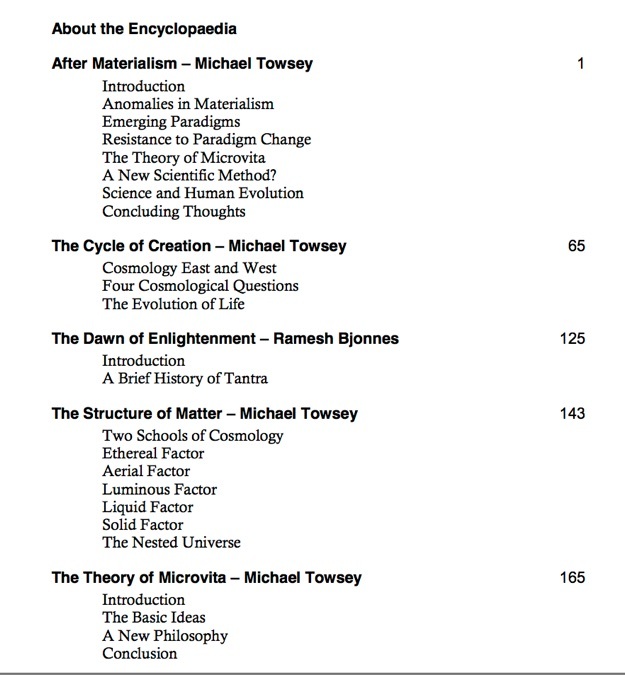 Michael Towsey suggests the theory promotes a new way of doing science that involves a synthesis of East and West. The contribution of the West is its rigorous three-part methodology of observation, rational theorizing and validation. The contribution of the East is to expand the domain of legitimate experience to include intuitional and spiritual experience. Western science must move beyond the dogma of materialism if it is not to create more problems than it solves.